How long have you been a photographer? I shot my first wedding in 1999. Since then I’ve been hooked. How many weddings have you photographed? I have photographed hundreds of weddings. Currently I shoot about 8-10 weddings a year. What is your wedding photography style? 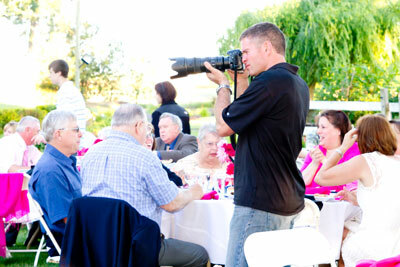 As a wedding photographer, I shoot a “Portrait Photo-journalistic” style for most of the formal wedding pictures. That means I guide the wedding couple in what to do and let it flow from there, creating beautiful, dramatic, and elegant wedding pictures. For your ceremony and reception I capture those special wedding moments mostly in a photojournalist / candid manner as to not interfere with the flow of the big day. Will you be the photographer at my wedding? Yes. I will be the wedding photographer at your wedding. How long does it take to get our wedding pictures back? It usually takes about 2-3 weeks to get your wedding pictures back. What equipment do you use? I shoot everything digitally using professional digital Nikon cameras and accessories. I have backup equipment for all the important stuff. Do you include the digital images with your wedding packages? Yes. Per your request, this can be either a digital download or USB drive option. All images are full-resolution with no watermarks. Do you have a second photographer? Yes. Many times, my wife and I are a team. Do you require a deposit to hold my wedding date? Yes, $300 + a signed contract reserves your wedding date. Do you travel to locations far from your home? Yes, I have been to the east coast, Hawaii, and all the western states. I love to travel. Do I get proofs to keep from my wedding? Yes. Every package comes with a hard-cover proof book that contains all images from the wedding. Can I post my wedding pictures online for friends and family to see? Yes, all your pictures go online for family and friends in your own private photo gallery. Can people order pictures from you online? Yes. When viewing your gallery of images there is an option to order images directly off the website. Do you do anything else besides photography? Yes. I also have a Master’s Degree in Education and currently teach PE during the school year. I love it! Have you ever missed a wedding for any reason? No. I have a perfect record. I do have a couple professional photographers that I can call if need be in an emergency. I am also a member of the Professional Photographer’s of Oregon and in an emergency a replacement photographer can be found through them!